My new golf instruction book, The Efficient Golfer, will show you how I helped my pro golfers go from #113 to #1 in putting average, win the US Open, set new tour scoring and putting records, quadruple their tour income, and increase their longest drive from 295 to 400. Everyone is so busy these days. There is less time for everything, including golf. So you want to be as efficient in the use of your time as you can be. How do you become more efficient in golf? How can you make better use of practice time? How can you power your golf swing with the least amount of effort, and the still best results? How do you improve your golf performance and achieve a lower golf handicap? The answer lies in measuring the golf swing and in golf swing analysis. Throughout history, measurement and analysis have been the key to progress in science, commerce, construction and manufacturing. Golf equipment has improved greatly over the past two decades largely through more sophisticated measurement and analysis. The Efficient Golfer will show you how to videotape, measure and analyze your golf swing and putting efficiency at home with your camcorder, a TV screen and a simple protractor. The key is knowing what to measure. Range is how far you turn away from the ball at the top of your backswing. Different backswing ranges will produce different results. In our book, we show you how to measure your Range from the videotape you take with your home camcorder and play back on your TV, using a simple protractor you can get in any office supply store. While the measurements are very simple and easy to do, they are quite powerful, as they can identify Range problems that affect how far you can hit the golf ball. They will also identify Range problems that can lead to low back pain or shoulder pain. 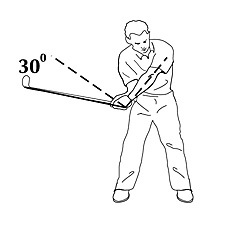 Interestingly enough, we have found that the most efficient golf swing is the opposite of what is being taught today. 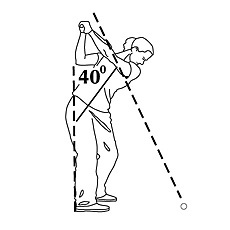 Here is the modern, restricted backswing. 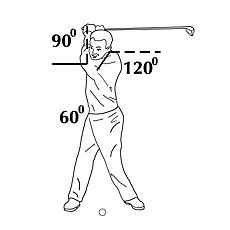 And here is an efficient backswing, one that will propel your drives at least 280 yards with little or no effort. Later in the book, we will show you the specific flexibility you need for this efficient golf swing, how to measure the flexibility you now have and what you can do to improve it. The second aspect of swing efficiency that you can measure is Sequence — the order in which you fire the parts of your body during your downswing. To do this, you put some ordinary tape on your lead knee, hip and shoulder and tape yourself hitting some balls, or just taking your normal swing in the backyard. You play the tape back on your camcorder or deck until you get to the top of your backswing, and you draw circles around the tapes, and around your hands and clubhead. Now advance the tape one frame at a time, and write down which part moves first, second, third, fourth and fifth. This is your Sequence. In the book, we show you what the most efficient swing Sequence looks like, and why it is so effective (one answer is that it was the sequence used by five of the top golfers in history). Now that you have a videotape of yourself, you can analyze your Separation. When you advance your videotape one frame, you are moving forward in time 1/30th of a second. This means you can use your tape to gauge how much time separates the movement of each part of your body. Do you know how much Separation most golfers have? Why is Separation so important? More than anything you do, Separation allows you to develop truly effortless power. Each stage fires, then separates. It’s certainly more efficient than all stages firing at the same time, or firing and not separating. If you think about the golf swing from an engineering point of view (which we do), a golfer is basically putting the clubhead in an orbit around his body. This orbiting clubhead strikes the ball, sending it into a short orbit around the earth. What is the most common way to get a satellite into orbit? A golfer can be considered a five-stage rocket. This is a useful analogy, because it helps us to identify the most efficient Sequence, and it dramatically illustrates the importance of Separation. In The Efficient Golfer you will learn how to be your own rocket scientist, measuring and analyzing your golf swing far more accurately than is done by conventional golf instruction. Measurement and analysis are the keys to progress in golf, as in every other part of life. We all know that clubhead speed is the answer to longer drives, but it is far more important to measure the speed of your hips. Hip speed is the key to effortless power. The fastest hips in baseball belong to Barry Bonds. The fastest hips in boxing belonged to Muhammed Ali. The fastest hips in golf belong to Tiger Woods. Yes. It is a pattern of winning, of re-writing the record books with fast, early hip rotation. In The Efficient Golfer we show you how to measure your hip speed. We also show you a common movement in golf that really derails your hips from their appointed task — providing the power in the golf swing. 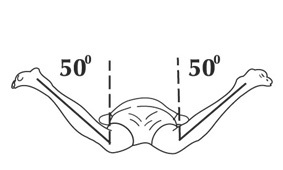 Speeding up your hip rotation will also reduce or eliminate casting your club. Here is a golfer with late, slow hips. 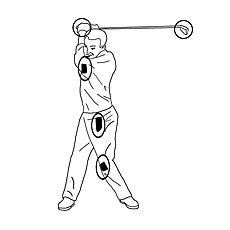 Here is a golfer with fast, early hip rotation. Finally, we come to Alignment. While Range, Sequence, Separation and Speed determine how far you hit the golf ball and how consistently you can do it, your Alignment determines your accuracy. No one wants to spray balls left and right, but did you know that a common move taught to all golfers almost guarantees that you will? 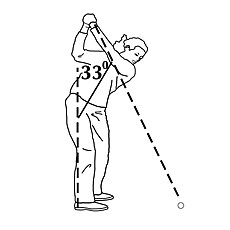 This simple move changes your Alignment, so that your clubface is not square at impact. 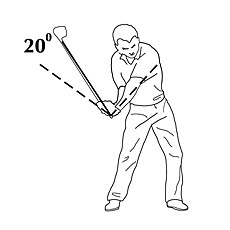 You then have to use your hands to square up your clubface. Sometimes you do, but sometimes you are late and you push the ball to the right. Other times, you are too early, and you hook the ball. Once you eliminate this common movement, you will improve your Alignment, and then you will be hitting your ball longer and straighter. The Alignment we are talking about is the alignment of the spine from the front. 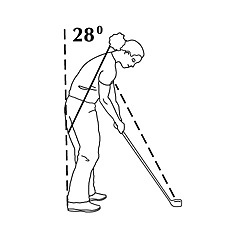 In The Efficient Golfer you will learn how to measure your spine alignment from the front, and how to improve it. We also show you how to measure your Alignment from down the line. The biggest problem golfers have making good ball contact (and accurate shots) is that they change their spine angle between address and impact. Here is one of our pro clients before we worked with her. Notice that her Alignment changes from 40° to 28° in the 1/3rd second it takes to go from the top of the backswing to impact. Now look at her after we measured and she improved her Alignment. This change in alignment improved her accuracy so much that she was able to quadruple her tour income in just one year. Most golfers use the flight of their ball as the hallmark of how well they are doing in golf. This approach, unfortunately, leads to a dead end. The reason is that you can improve your ball flight by patching up your swing. With good hands, you can make sudden, last second adjustments to your swing, but this is no better than repairing your car with duct tape. It will hold things together for a while, but right when you need everything to work, it can just as easily fall apart. You don’t want a duct tape swing. You want an efficient, effortless swing, one that you can count on day after day, week after week, year after year. The path to efficiency is paved with a protractor. The Efficient Golfer will show you how to make the protractor your best golf training aid. It will show you how to measure and analyze your swing efficiency. Once you know where the problems are, then we show you how to fix them. Then your golf swing emphasis will be ‘How well am I controlling my Range, Sequence, Separation, Speed and Alignment?’ and not on your ball flight. Your ball flight will be better, because you have a better-engineered swing. The final frontier in golf is the golfer. Clubs have gotten better through re-engineering. Now you can become the golfer of your dreams by re-engineering your own body. We are not talking about stretching, lifting weights, yoga, running, etc. The new frontier in golf is the connective tissue. Most people think that they are made up of muscles, bones, nerves, skin and internal organs. But when you look inside the body, you see mostly connective tissue. 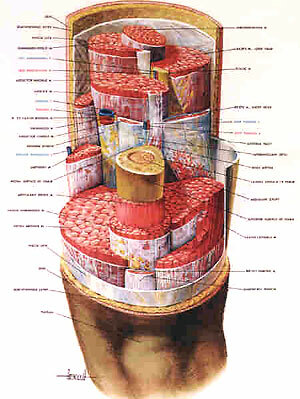 Membranes of connective tissue surround every muscle, bone, nerve, and internal organ. Your body moves on this connective tissue. These membranes allow your muscles to slide past each other, which they have to do in order to stretch or contract. Connective tissue shown as white. If these membranes don’t slide, you don’t move. Which is exactly what happens to golfers. Their membranes get bound together with microfibers, a mild form of scar tissue that accumulates over time. Often the result of innocuous injuries or overuse (running, lifting weights), these microfibers bind adjacent layers of connective tissue together as part of the healing process. They are nature’s internal cast. The problem is that once the area has healed, the microfibers not only do not go away, they tend to accumulate over time, making people stiffer as they get older. Here are some examples of golfers who now have ‘new’ bodies for golf after they got rid of their microfibers. For more than 35 years, I have been helping athletes improve their performance by improving their efficiency. In addition to my success with tour and amateur golf players, my Olympic athletes have won 44 Gold Medals and set 11 World Records. I have written for The New York Times, Golf, et.al, served as an NBC Sports broadcast analyst for the Olympics, and have been the subject of articles in Sports Illustrated and Golf Digest, among many others. But my greatest satisfaction comes from teaching. I like to see athletes face's light up as they see and understand what is going on when they play their sport. The Efficient Golfer takes the mystery out of golf. You no longer have to wonder why you are not getting better, you will know exactly why. You won’t have to practice endless hours, because you will have a more efficient swing that requires less practice. A better swing. Better scores. More enjoyable golf. There are good golf instruction books out there. The problem is that they lack a coherent theory. Since they were all created by golfers who have played since they were very young, they have some of the new laid on top of much of the old. Frankly, it’s time for something completely new. I look at the golf swing from the point of view of an engineer. I see a disaster in the making. 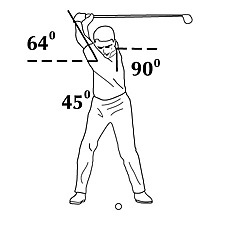 I see (and you will too) that the common address position forces golfers to spend countless hours at the range. I see (and you will too) that the most popular movement in the downswing sprays balls left and right. I see (and you will too) that the design of today’s putters produces inconsistent putts. The conventional putting stance itself is unstable. Change your putter and stance, and you will see more balls drop with fewer strokes. The reason golf is so challenging has nothing to do with the game itself, it is a result of the conventions of the golf swing and putt. Once you see how these common conventions sabotage your chances for success, you can change them. But until you measure and analyze your golf swing, you will never see their impact on your game. The Efficient Golfer will open your eyes to see what is really happening in your golf swing and what you can do to change it. The Efficient Golfer will give you the tools you need to objectively measure and analyze your golf swing, and show you how to improve it.